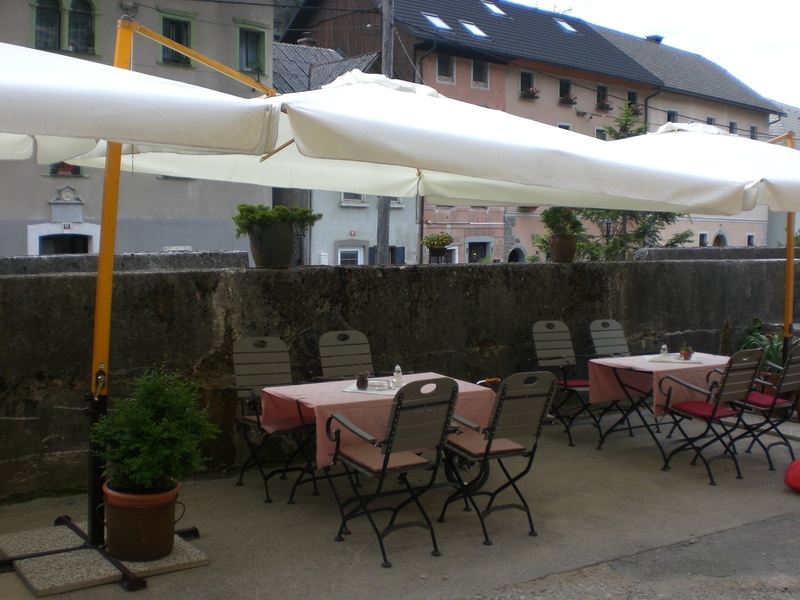 A double whammy of blogs this week, for two reasons: the first being that I simply couldn’t wait until next week to share my enthusiasm about the Pr’Kovač Inn, in Kropa, which also just happens to be one of my favourite villages around the Radovljica area; secondly, because there is so much going on at this time of year I have far too much to write about for just one blog! Perhaps I might also provide you with some inspiration for where to visit this weekend too. I always enjoyed visiting Kropa; more often than not I visit by bike, either as part of a longer ride elsewhere, such as over Jamnik, or for a hike up to the Vodiška planina highland. 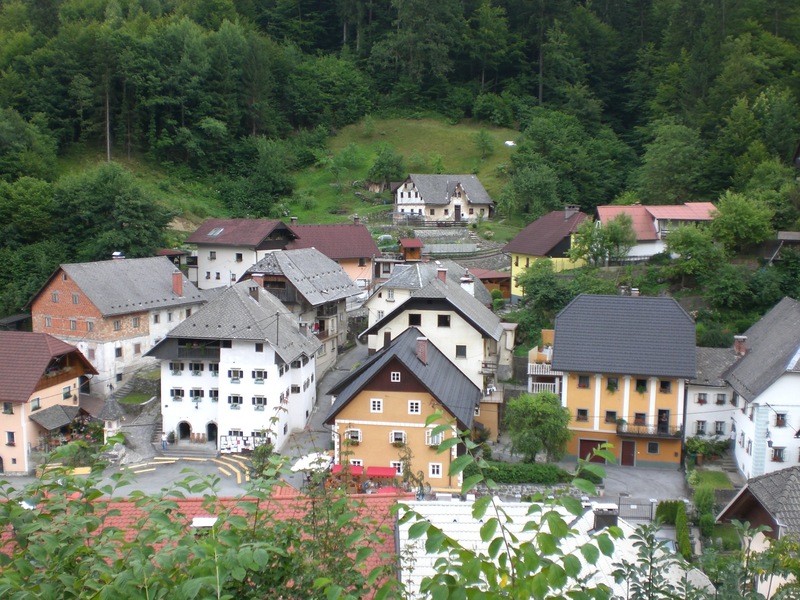 From Radovljica is it 10 kilometres to Kropa via the road through the tranquil Lipnica valley. Kropa’s somewhat isolated position, nestled at the foot of the far western edge of the Jelovica plateau, is also part of its appeal, together with its rich architectural and cultural heritage which make it unique, charming and characterful. The village is known as being the cradle of iron forging in Slovenia and this is evident throughout the entire village where each house is adorned with some kind of ornate iron work and the village is full of interesting sights such as the rushing waters of the Kroparica stream, the two churches and various sculptures and memorials. Interestingly, in 1953, Kropa was also the first village in Slovenia to receive the status of being a protected cultural monument. The Pr’Kovač Inn is located right in the heart of the village and as soon as you enter through its door, you get a sense of what is to follow. The décor and the ambience just smack of good, honest, uncomplicated home-cooking and hospitality, and it doesn’t disappoint. Its all in the detail even down to the the crockery, cutlery, menus and presentation. In fine weather, a seat outside in the shady area next to the Kroparica stream is also pleasant, though do be sure to go inside a take a look! Owned and run by Blaž Staroverski (seen with me above), the restaurant also recently received rave reviews and top marks in one of Slovenia’s leading newspapers, and since it is also one of the seven restaurants that participate in Taste Radol’ca, and being one that is still remaining on my list, a visit was long overdue. 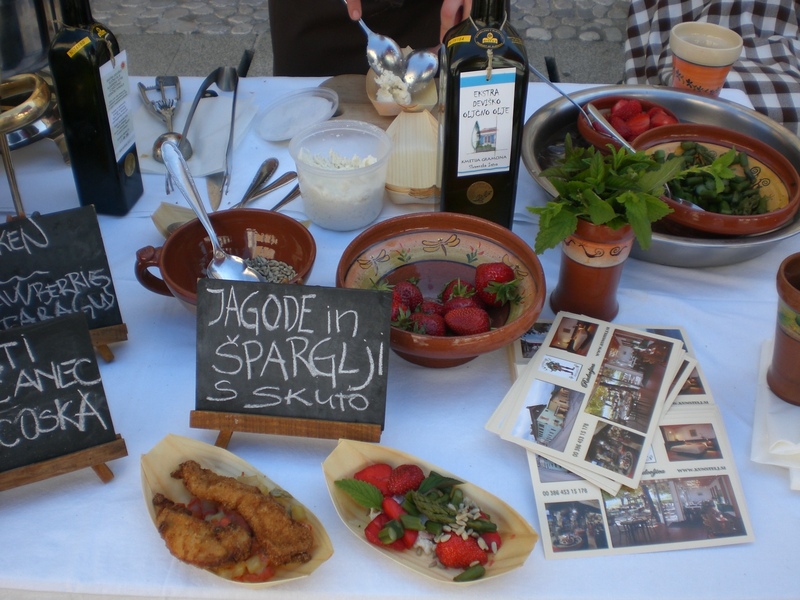 Being a unique village, Kropa also has some original local dishes and therefore I left it to Blaž to acquaint me with a few tasting samples of just some of the dishes available on the menu. With Kropa’s mere existence being based on the tradition of blacksmithing, most of the population would have, to some extent, been involved in hard, physical labour and thus required robust, hearty food. This tradition still continues, however, under Blaž’s leadership, he manages to create robust, hearty dishes with modern innovation and finesse – and all using the freshest and most local ingredients available. 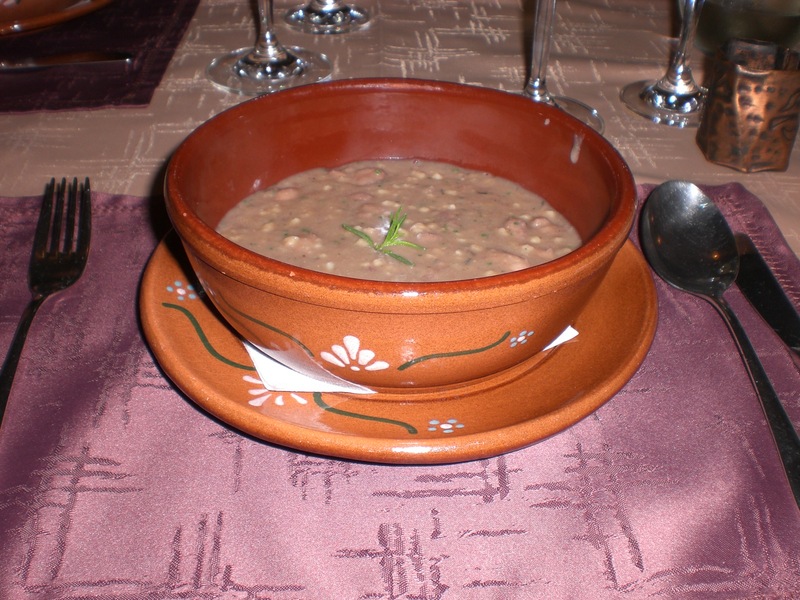 First, a thick hearty bean soup, served in a typical clay dish, which one can imagine would really hit the spot on a cold winter’s day, flavoured with home-grown herbs. 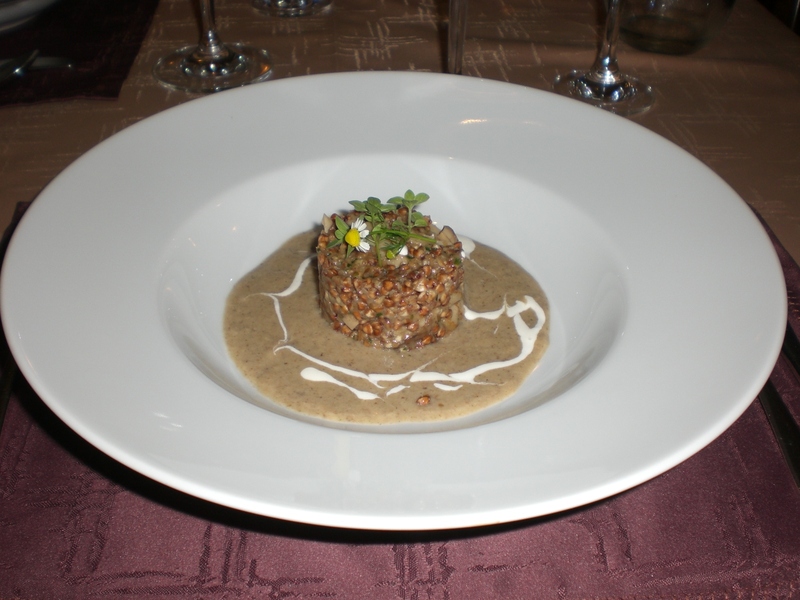 Next was buckwheat served with mushrooms and a creamy, rich mushroom sauce. Buckwheat is used a lot in Slovene cooking, either as an ingredient or as a stand-alone dish but, for my palate, it can sometimes be a little dull and lacking in flavour if not well cooked and seasoned. This dish however was delicious, really flavourful and I could have quite happily eaten a whole dish of it. 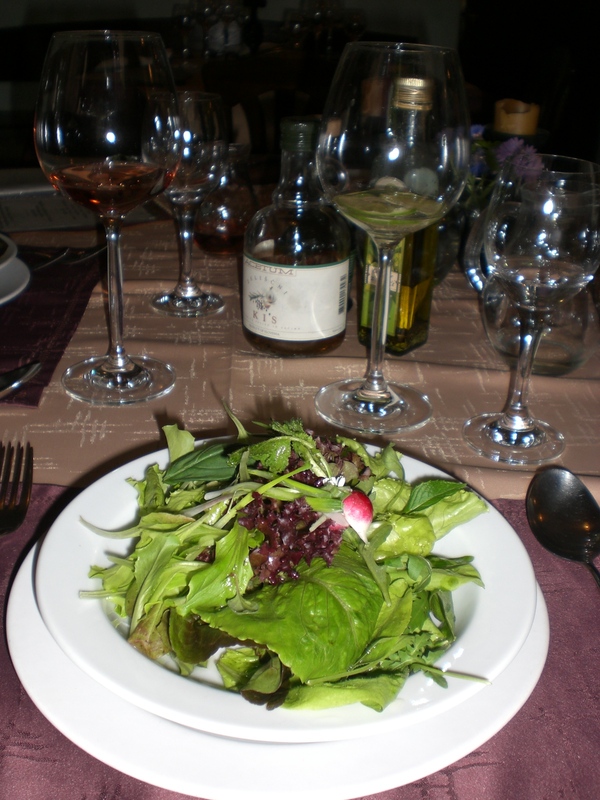 A salad followed – all of course direct and fresh from the restaurant’s own garden and lightly dressed with oil and vinegar. With just enough room left, I, of course, managed to sample the dessert too! Described as a ‘buckwheat omelette’ it was more reminiscent of a light muffin, filled with a fruit sauce and accompanied by forest strawberries, chocolate sauce and ice-cream coated in a light nut and crumb crust. 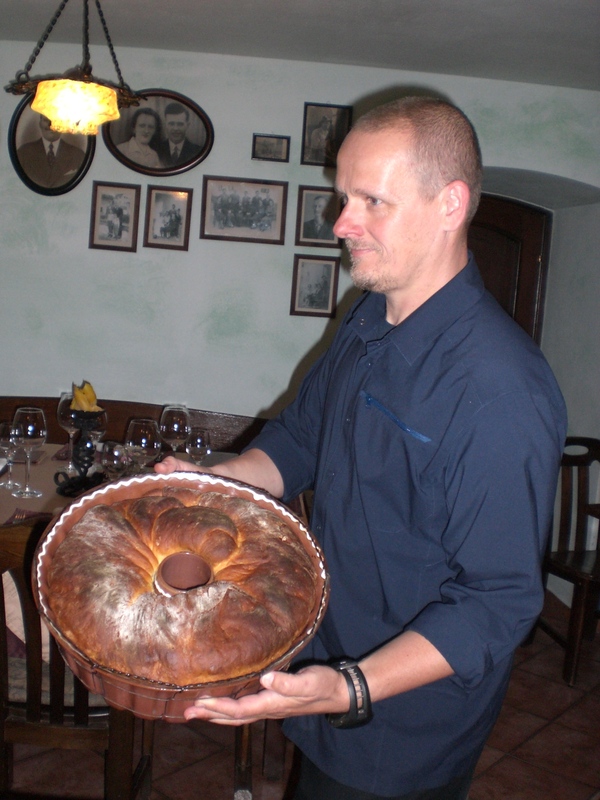 Although I didn’t have an opportunity to try it on this occasion, since it was fresh out of the oven and baked to fulfil an order, the HUGE tarragon potica, as seen in the photo above looks a-m-a-z-i-n-g! I shall definitely be returning to test that sometime soon! Despite the mountain of work awaiting me, and despite my best intentions to spend the day tackling it, when I woke up on Sunday morning to see the perfect blue, cloudless sky above Stol, theI lure of the mountain ‘proper’ won out over the lure of the mountain of work – and so off I went. 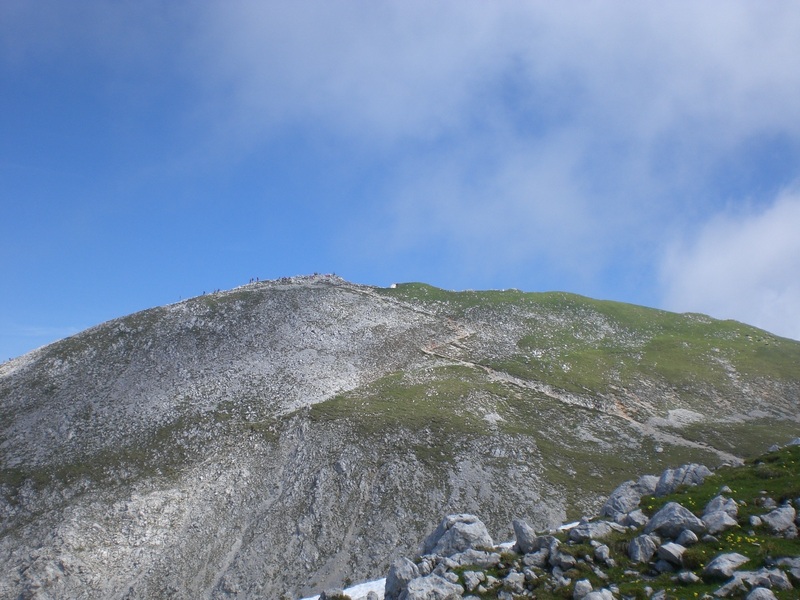 At 2236m, Stol, meaning ‘chair’ due to its shape, is the highest peak in the Karavanke range, is a landmark in the Gorenjska region. Luckily for me, I can see it from my bedroom window. It is quite common for its peak to be shrouded in cloud and often accompanied by a strong wind too. However, this Sunday there wasn’t a cloud in sight other than a few whispy ones that disappeared as quickly as they appeared. There was also no wind blowing, not even a breeze, and also neither searingly hot nor unpleasantly cold – in short, a perfect day for it. 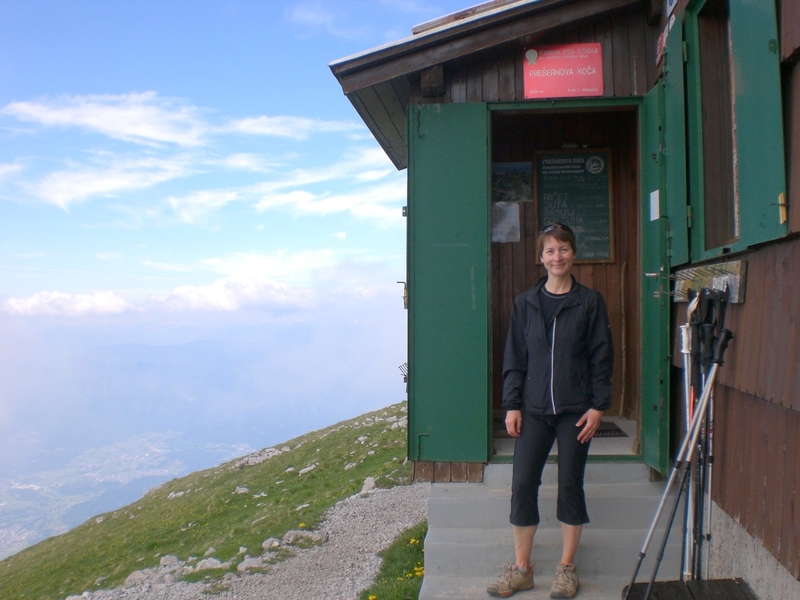 Many people choose to drive up and start their hike from the Valvasor mountain hut (1181m), cutting about an hour off the time needed for the ascent. 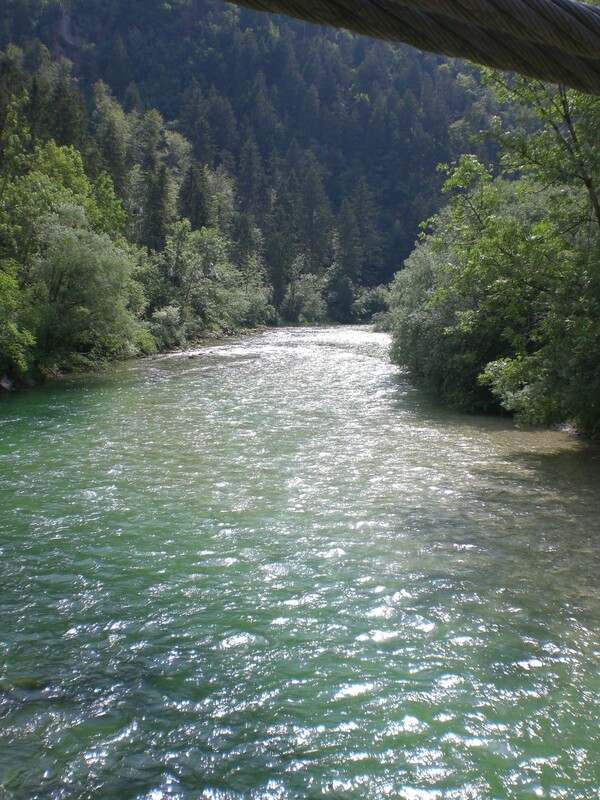 I however prefer to begin from the valley floor in Završnica. Setting off from the car park next to the small reservoir, I followed the path, first to the Valvasor hut, then onwards and upwards via the (slightly steeper and shorter) Žirovniška path, descending via the (slightly longer and less steep) Zabreška path – this making it a circular route. 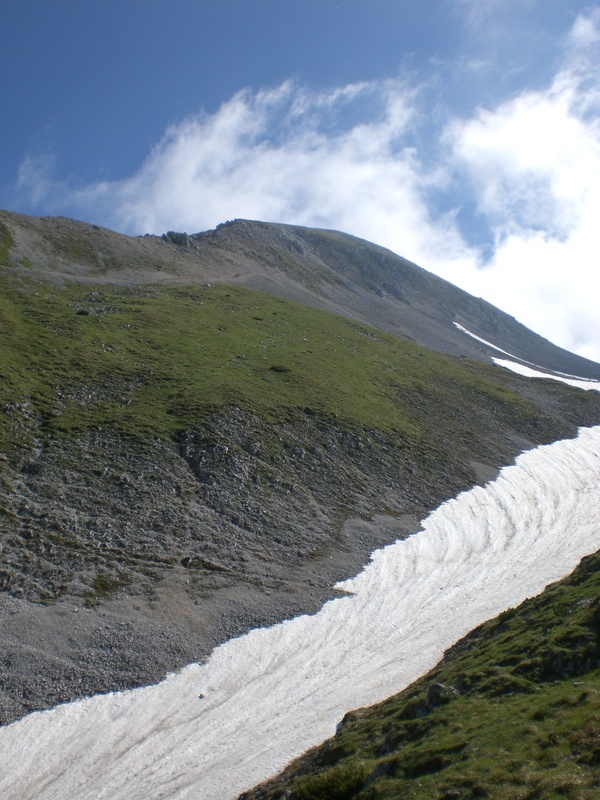 As can be seen in the photos below, there’s still a little snow up there, in the gully between the top of Stol, to the left, and the Prešeren mountain hut (Prešernova koca), to the right. However, as the route up is on the sunny, southern facing, side it has almost all gone. The same cannot be said of the Julian Alps, where there is currently still a lot of snow remaining. As the Karavanke form a natural border between Slovenia and Austria, Stol can also be climbed from the Austrian side, though the ascent is more exposed, more rocky and, at this time of the year, more snowy than the southern facing Slovene side. Of course, with it being such a lovely day, I certainly didn’t have the place to myself. You can probably just about make out the ant-like looking line of people on the top in the photos below. The Bled Sava Hotels also have a packed programme of musical events throughout the summer including traditional Slovene evenings, music and dance nights by the lake, acoustic music evenings, a cappella performances and more – and even better they are free to attend too (though of course some form of eating and/or drinking will be encouraged!). Talking of hotels, last week, coincidentally on the same day, saw the official opening of 2 new exciting additions to Slovenia’s range of hotels. In Ljubljana, the Four Points by Sheraton Ljubljana Mons opened. This was quite a major event as it is the first globally branded hotel to enter Ljubljana for over a decade. Meanwhile, in Bled the new eco-tourist green resort – Garden Village Bled – also opened. I have yet to go and take a peek (its on my ‘to-do’ list) but it looks pretty exciting and unique and I will write more about it once I’ve had a chance to get there in person. Schools in Slovenia officially break up today (24.6.). Yes, the school summer holidays here are very long! Tomorrow, 25th June, is a public holiday – Statehood Day (dan državnosti). The start to last week was HOT, to say the least! Temperatures were in the mid-thirties up until Thursday when, as forecast, a big storm swept through the valley, bringing the temperatures right down. At this time of year it’s not uncommon to have afternoon storms, some of them quite violent, so its usually generally best to get up and out early to be back in the safe and dry before they hit. Despite the climate here being alpine, the afternoon storms can sometimes make it feel like being in the tropics, but they don’t usually last long. I have compiled quite a list of places to go and things to see/do, adding to it whenever I read about a new path or somewhere I haven’t yet been, and gradually ticking them off the list as I get round to them. One of such is the Grmečica waterfall which, as of Saturday, I can now tick off the list too! 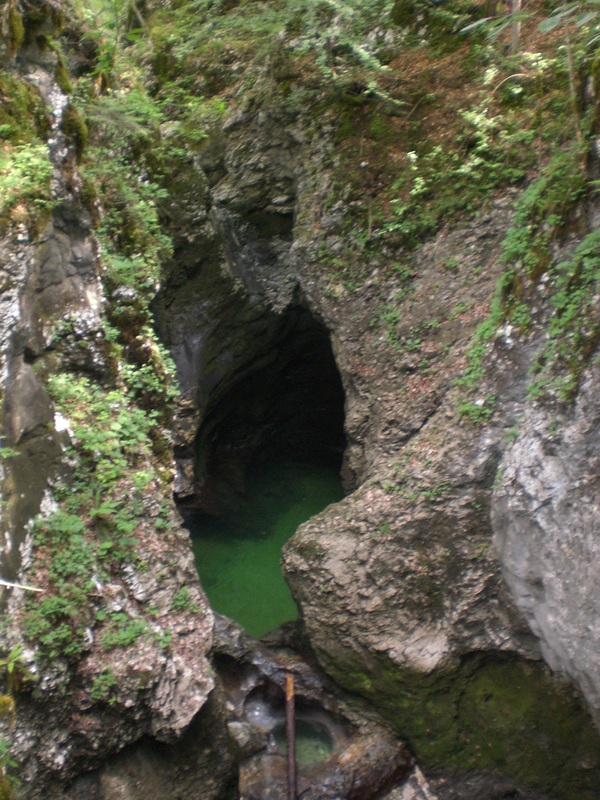 Slovenia has hundreds of waterfalls and Grmečica must be certainly one of the less known and is far from being one of the biggest/highest/widest or any other such superlatives. However, to me at least, therein lies its beauty. Admittedly, the waterfall, which seemingly emerges from nowhere, isn’t in itself that impressive, there’s no gushing water, more of a trickle, certainly at this time of the year. However, its location amid hidden canyons, with crystal clear water and small pools, off the beaten track, and rarely frequented, makes it all the more interesting. 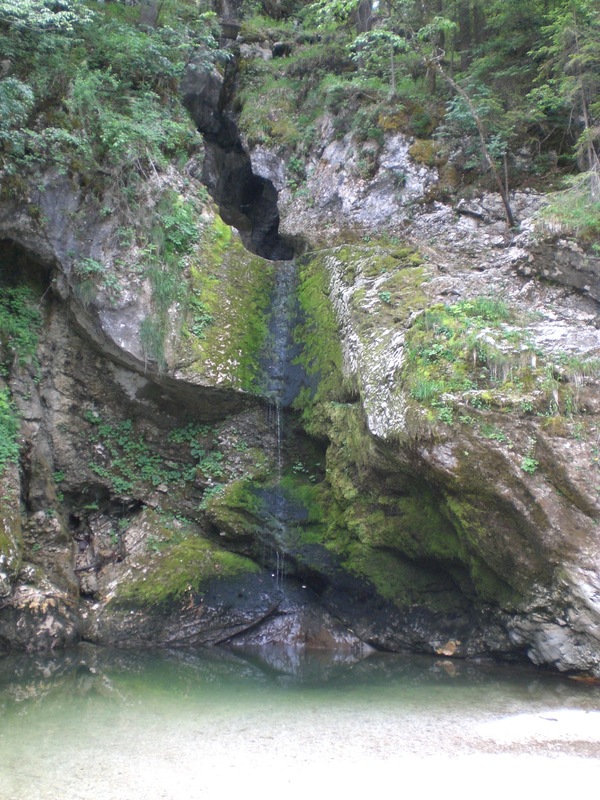 The waterfall, hidden under the northwest edge of the Jelovica plateau, was previously barely accessible as there was no way of crossing the Sava Bohinjka river. However, since a new suspension bridge across the river was built in 2010, it has now become a lot easier to reach. 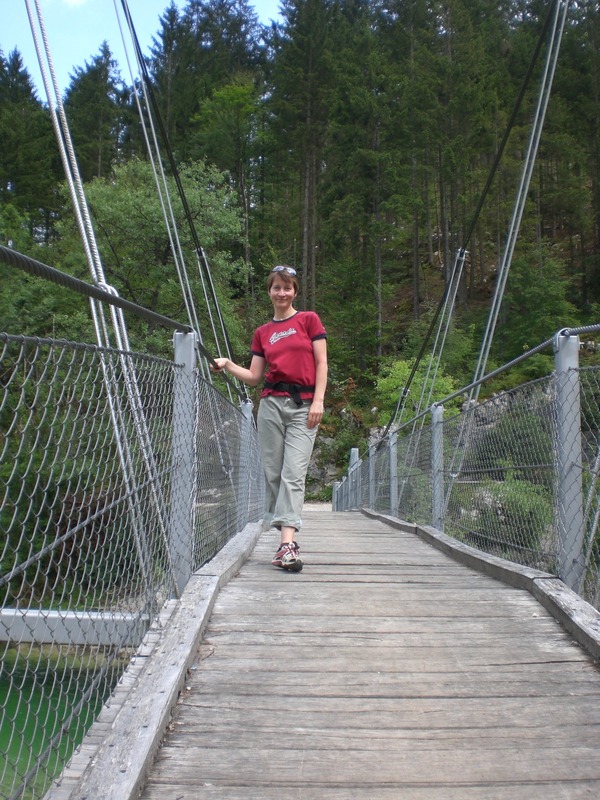 It is best reached on foot from the village of Nomenj, on the road from Bled to Bohinj. A path leads under the railway line, across the river and then alongside the river before reaching the waterfall. After seeing the waterfall you can double-back to take the unmarked, but clearly visible, path which leads steeply up through the forest above the waterfall for impressive views deep down into the canyon below. There are ropes installed in some places which indicate that the area may be, now or perhaps in the past, used for canyoning. However, clearly a lot of work will be necessary to clear the debris from this winter’s ice-storm. A word of caution though, do have good footwear and look where you are treading. A misfortunate stumble over a tree root has left me nursing a bruised and battered shin, which is now every colour on the spectrum of the rainbow. Having a freezer chock full of everything but ice, Saturday evening was spent with a variety of frozen bread and vegetables on my shin!!! 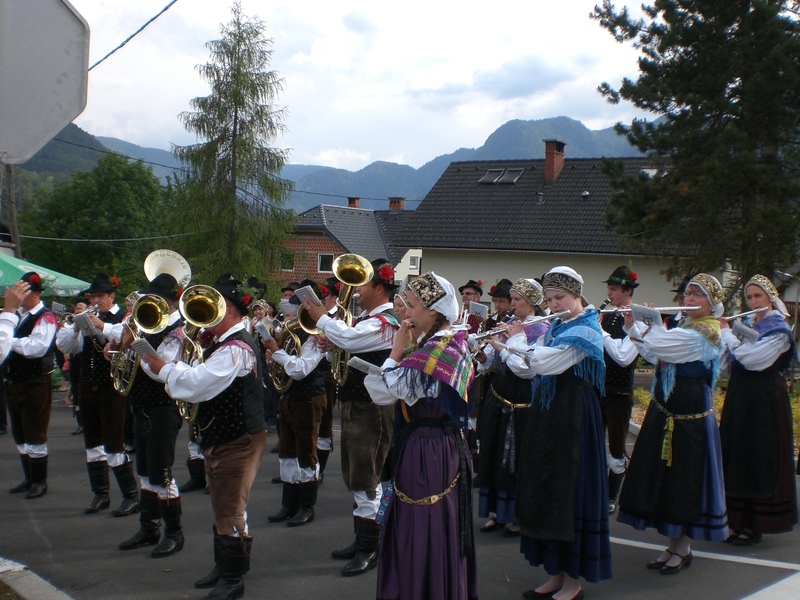 On the way back from seeing the waterfall, a short detour through the village of Bohinjska Bela proved fruitful as I happened upon a village festival taking place and was able to watch the parade, listen to the music and enjoy the merriment – as were it seems the entire village! At this time of year there is a lot happening in and around the Bled/Radovljica area, to much for me to be able to list here, especially since one of the golden rules of blogging seems to be to ‘keep it concise’. Therefore, each week I will list just a few of the main highlights and some of my favourites events and attractions. 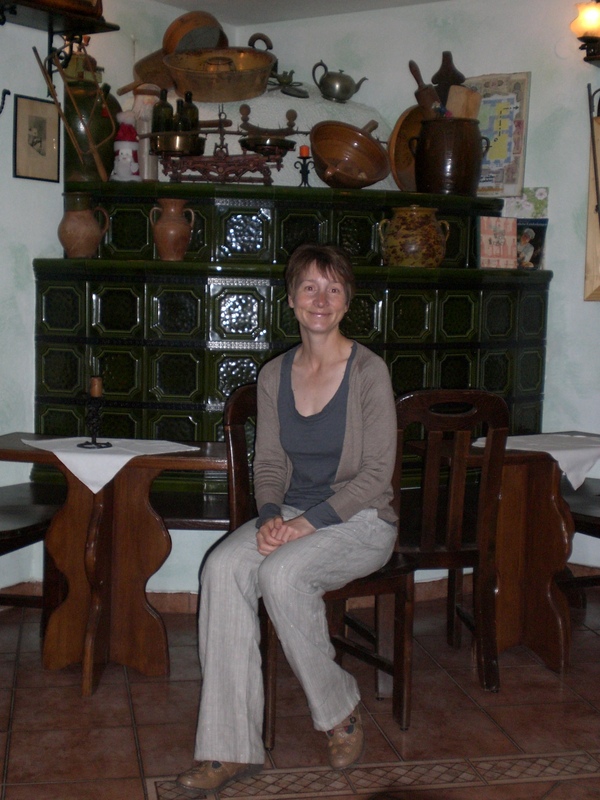 However, for more details, and up-to-date information, take a look at my ‘Adele in Slovenia’ facebook page (‘Like’ it) and/or use the links on the right to the tourist office websites. 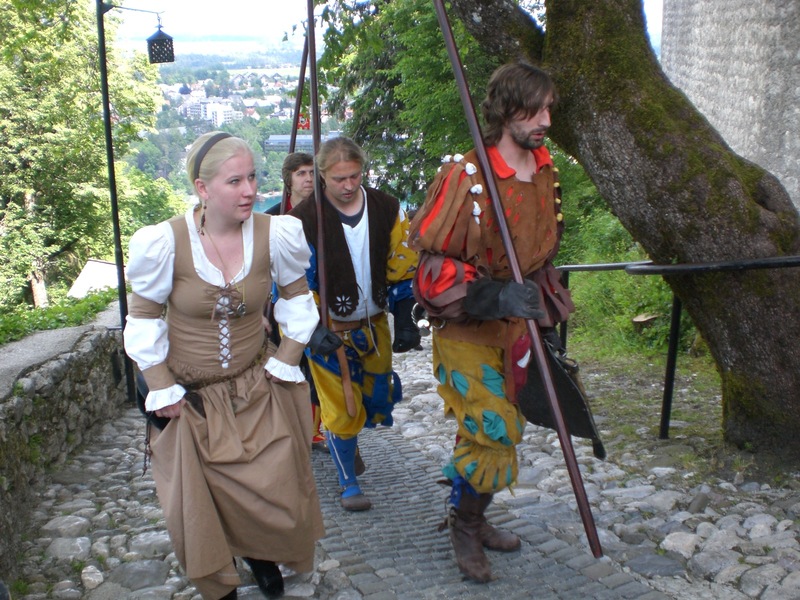 On Monday 23rd June, Midsummer’s Eve will be celebrated in the usual manner with a bonfire and medieval events at Kamen Castle in Begunje. The ruins of the gothic and renaissance castle, built in the 12th century by the Counts of Ortenburg, provide a magical setting for the celebration. Phew, what a scorcher of a weekend. Temperatures were, and still are, up in the high-twenties/early thirties and the sights, sounds and smells of summer abound. I’m in my element at this time of year as I love the heat, the wild flowers in the meadows, hearing the chirp of crickets, the cloudless blue skies, trying the myriad flavours of ice-cream (illuminous blue ‘Smurf’ flavour anyone?! ), and of course pursuing all my favourite sporting activities, in particular, cycling. On Sunday I set off for my first, of doubtless many, of this year’s rides through the Radovna valley, which is always an oasis of cool when temperatures soar. 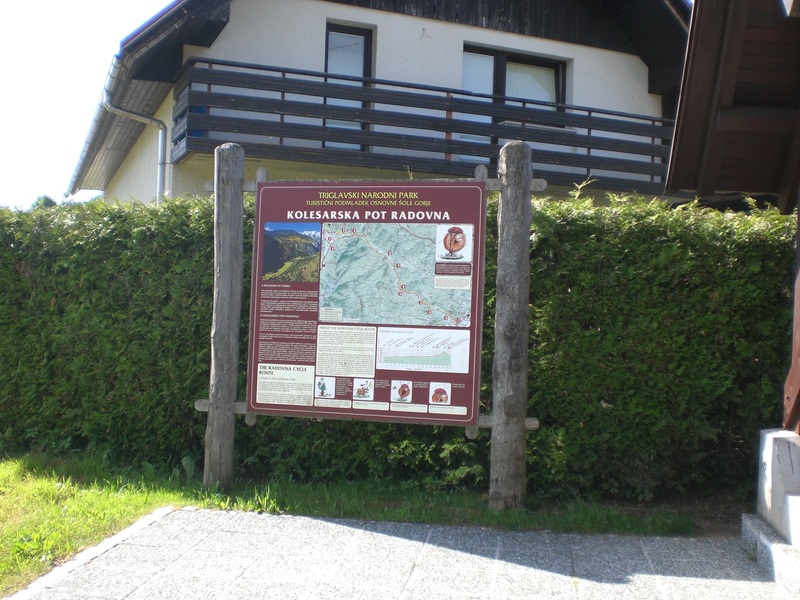 The start of the 16km Radovna Cycle Route officially begins where the village of Gorje ends and the road begins to climb upwards toward the Pokljuka plateau. From here a right turn leads downhill to cross a bridge over the Radovna river, for the first of many ‘wow’ moments of the ride. 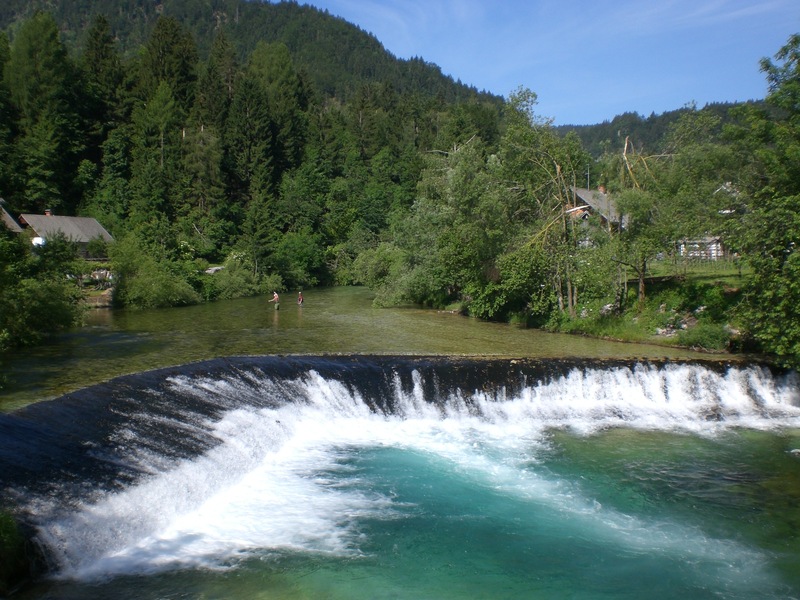 The Radovna Valley is between the Mežakla and Pokljuka plateaus and is part of Triglav National Park. Though it is usual to encounter a few cars along the path, they are fortunately fairly few and far between (and in fact today I only met a few motorbikes and no cars at all) as the road is mostly unmade and best explored by bike. I certainly hope it remains this way as cars travelling along the road create a lot of dust which is most unpleasant for cyclists and besides, there are more than enough roads elsewhere so I say ‘Leave this path to us cyclists!’. Along the route there are a number of places to stop, information boards and sights of interest such as the Psnak Mill, the burnout ruins of Radovna and the Napoleon Stone, as seen below. According to tradition, the Emperor Napoleon’s initials were carved into the stone when his army was said to have marched though the valley at the beginning of the 19th century. My ride however was significantly longer as I set off from home, first to Bled then on through Gorje to the Radovna valley. Instead of then continuing to the head of the valley I took a right turn across the pastureland and past the popular Psnak Tourist Farm and restaurant, from where there are breathtaking views of the Julian Alps rising up above the Kot and Krma valleys – definitely right up there among my favourite views around – and then up the short but sharp 18% incline before the long well-earned descent to the village of Mojstrana. 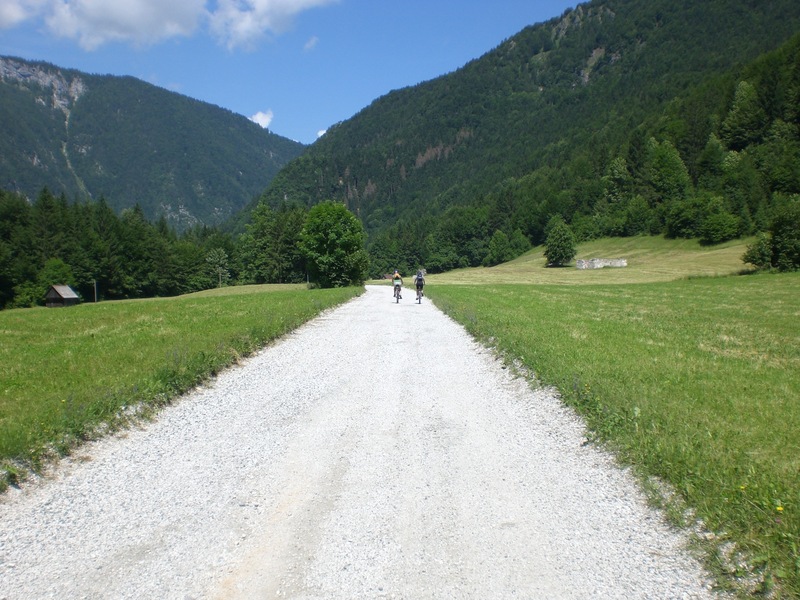 From there it was a short section of road riding to meet up with the D2 cycle path again in Jesenice, back through Zirovnica, and then via the Imperial road to return to Radovljica. I don’t have any type of bike GPS or other measuring device, as I’m not one for obsessing over measuring distances, but I’d guestimate the round trip is at least 60km. You can see more pictures on my Pinterest page. Despite Slovenia being crammed full of unspoilt countryside, forests and quiet backwaters, unfortunately it does lag behind somewhat when it comes to designated cycle paths, something that was evident, as it is every weekend and holiday during fine weather, by the lengthy procession of bike-laden cars I witnessed this morning heading towards the Mojstrana to Kranjska Gora cycle path – one of the few safe, traffic free i.e. family-friendly, routes in this area. 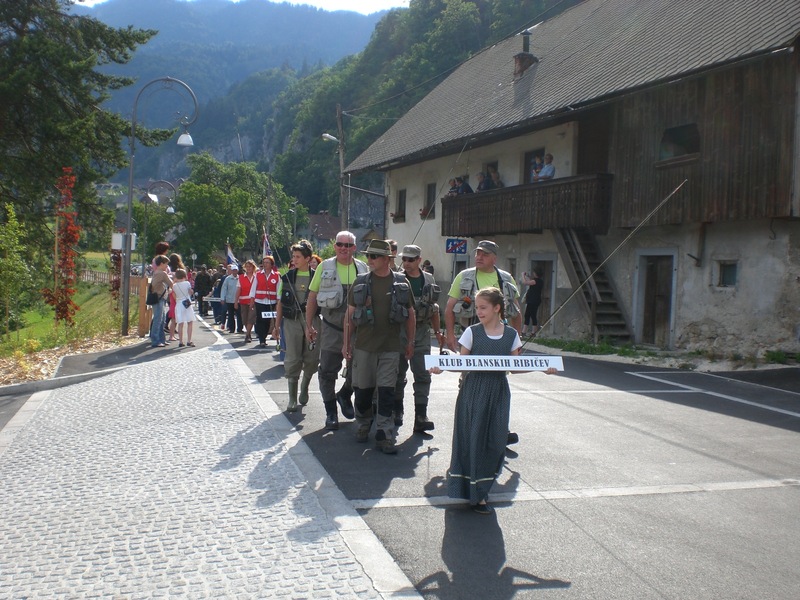 Progress is however being (slowly) made and the D2 route has now been extended through Jesenice, meaning it is no longer necessary to ride on the road through the town itself. 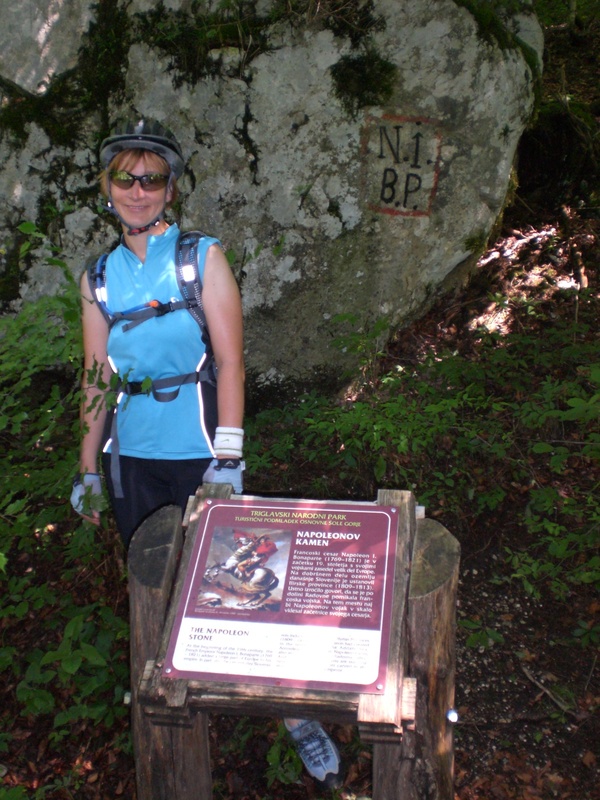 The final part of the link of the D2 from Jesenice to Mojstrana has yet to be completed and remains only suitable for those with mountain bikes. 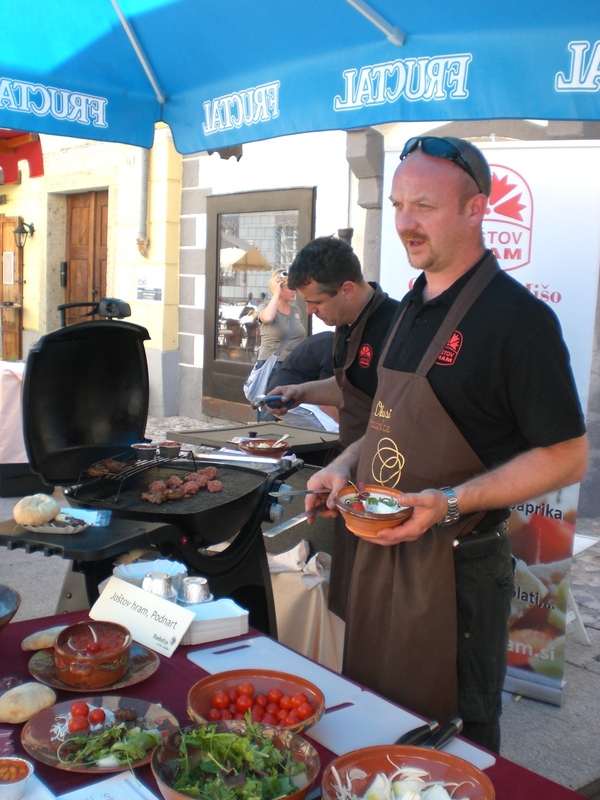 Saturday was more of a working day for me, however I did find time to pop along to the International Ceramics Festival in Radovljica’s old town centre to browse the stalls, take a few photos and taste some of the food on offer from some of the Taste Radol’ca restaurants, namely Gostilna Kunstelj and Jostov Hram – as pictured below. 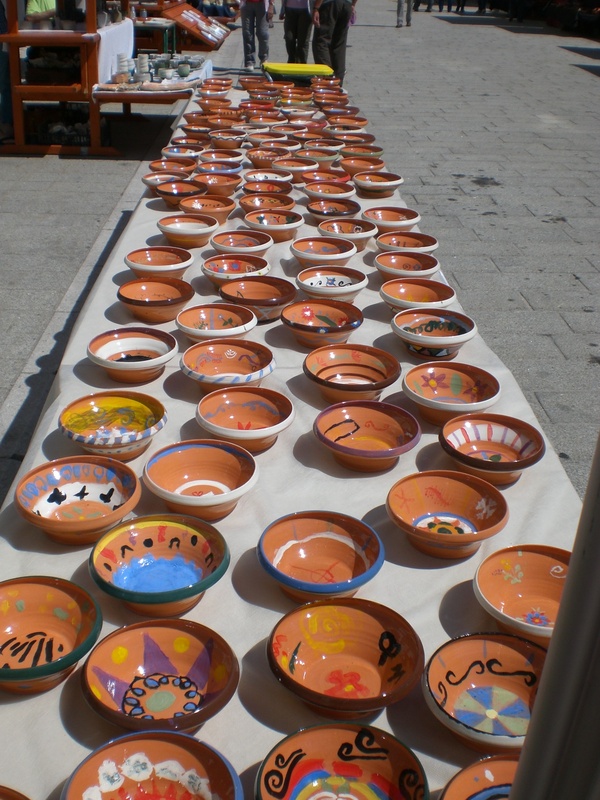 The brightly coloured bowls were painted by children from primary schools in Radovljica and the surrounding villages. 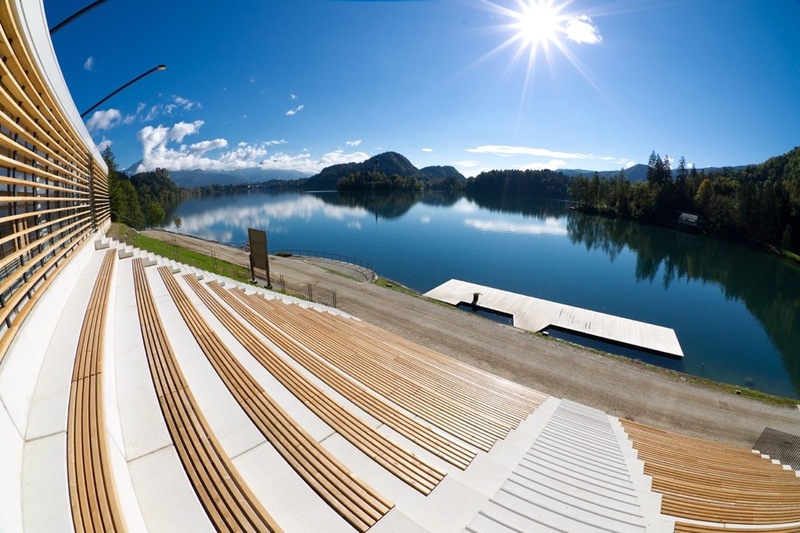 Next weekend Bled will be hosting the 59th International Rowing Regatta. 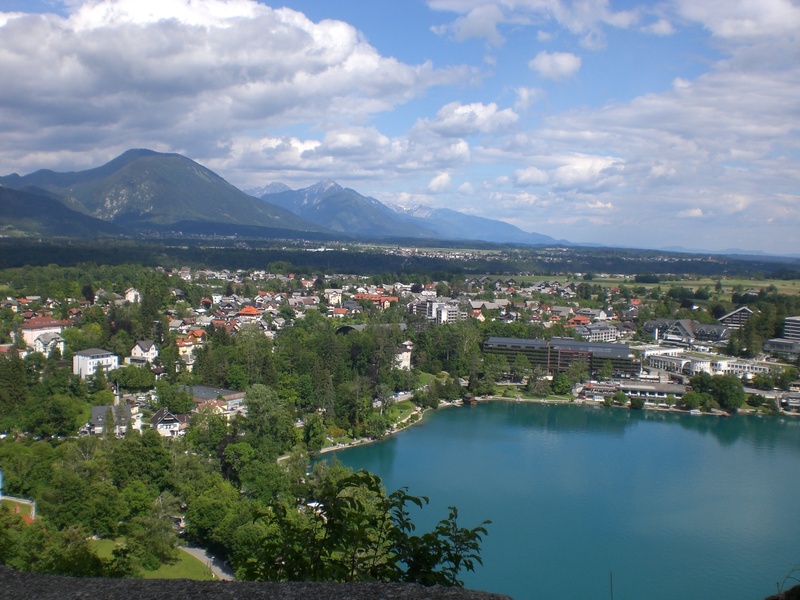 The event will begin on Friday with elimination heats starting at 4pm, with final events taking place on both Saturday and Sunday from 9am – 12.30pm, Lake Bled has long been a favourite and important location for some of the world’s major rowing events. Many national and international regattas are held there, as have been World Championships, and local oarsmen have successfully brought home numerous medals from major championships and Olympic games. The area of Slovenia that I live in is called Gorenjska, otherwise known as the Slovenian Alps region, and, in my biased opinion, the most beautiful part of the country – although pretty much everywhere you go in Slovenia you are spoilt for choice with stunning views, unspoilt countryside, sprawling forests, tranquil valleys, rolling hills and mighty mountains, crystal-clear rivers and lakes, fairytale castles and more. Visitors to the Gorenjska region, who stay at least one night at one of the participating accommodation providers, can take advantage of the free Gorenjska Guest Green Card which is a benefit card offering discounts on sights of interest, culinary delights, sports activities and other experiences in the region. This past week has been very April-like with not a day passing by without a shower or two. I’ve been fairly snowed-under with work so haven’t been able to make as many trips out as I would have usually, but fortunately on Saturday afternoon, when I ventured up to Bled Castle to watch the annual ‘Medieval Days’ event, the sun was shining in all its glory and Bled lake was looking at its shimmering best. It is possible to drive up to the castle but I, naturally, chose to walk up – it’s not that far and the effort makes the views all the more rewarding. 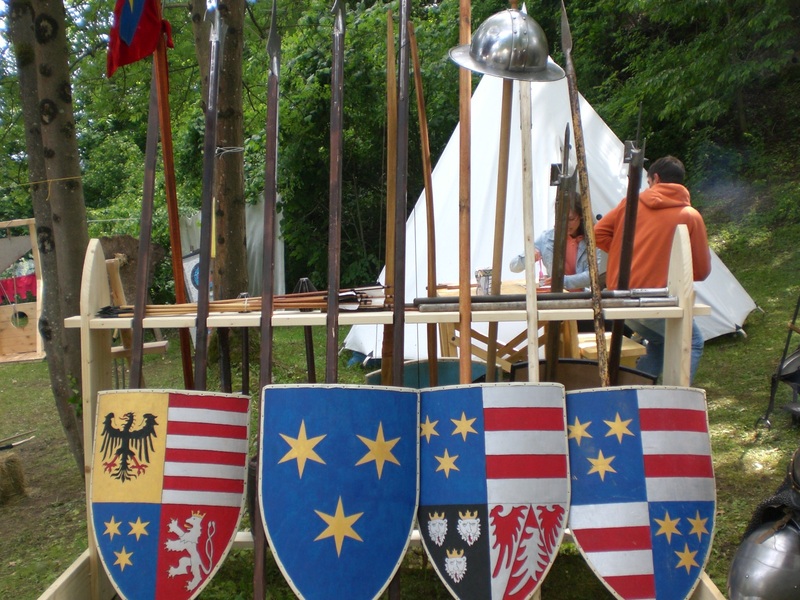 The Medieval Days event is a coming-together of medieval groups, not only from Slovenia but also from other European countries, who come to participate in the battle re-enactments and be a part of the event. 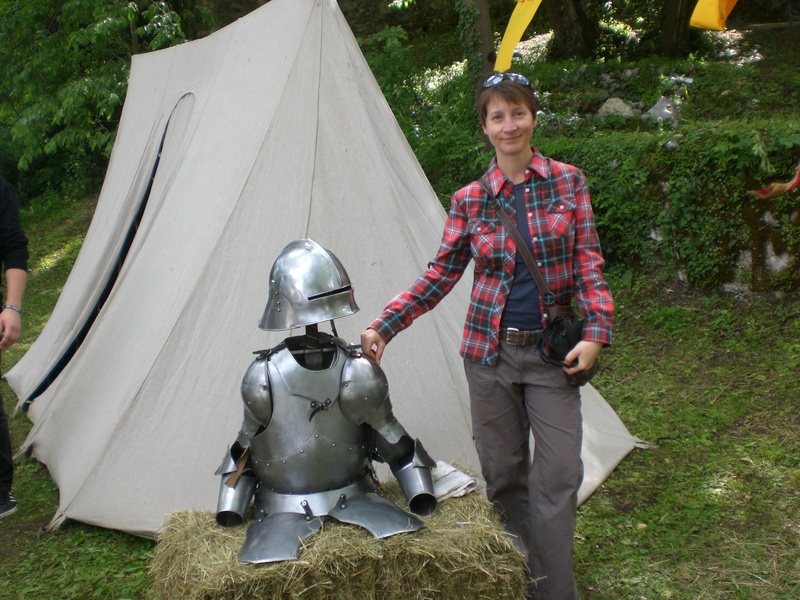 Visitors can mingle among the groups, talk to them, take a close up look at their costumes, weapons and armoury, browse the market stalls, watch the traditional craftsman at work and, as I did, generally enjoy the atmosphere and the far-reaching views across Bled, the Radovljica plains and the Karavanke range. This week Radovljica is hosting an International Ceramics Festival (http://www.radolca.si/kaj-poceti/dogodki/mednarodni-festival-keramike-radovljica-2014/83/591/). Various events, exhibitions and workshops are taking place throughout the week with the main event ‘Market Day‘ taking place from 10am-6pm on Saturday 7th June. 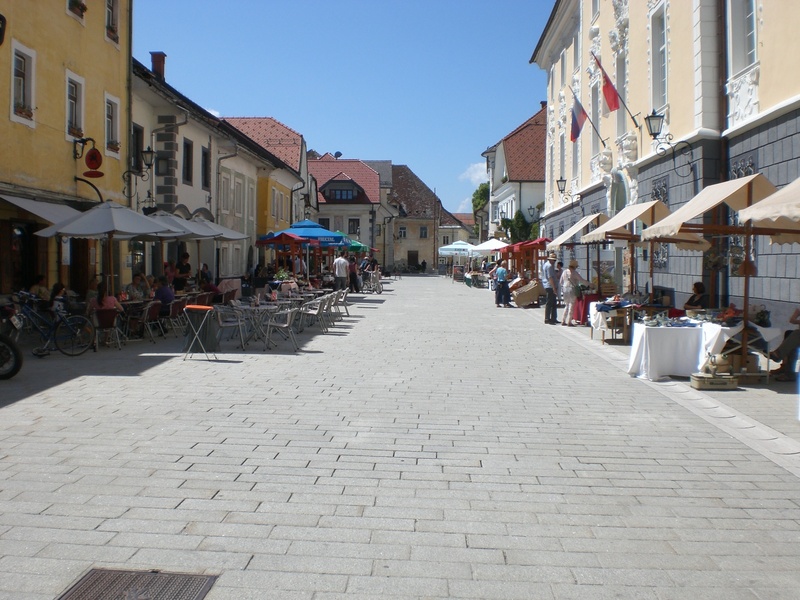 The old town centre and the Radovljica Manor will be abuzz with exhibitors and vendors of a wide array of ceramic products of all shapes and sizes, free workshops for children, music and entertainment, and food from the Taste Radol’ca restaurants. There will also be an opportunity to buy specially-made bowls and have them filled with a choice of the tasty food on offer – so you know where you’ll find me lurking – I so nearly managed a whole blog without the mention of food!